Hello there! Just a quick one as I have HEAPS of work to get done before the day is through. I love Kokeshi Dolls, Geishas and Japan so it may come as no surprise that I have done another Kokeshi design! 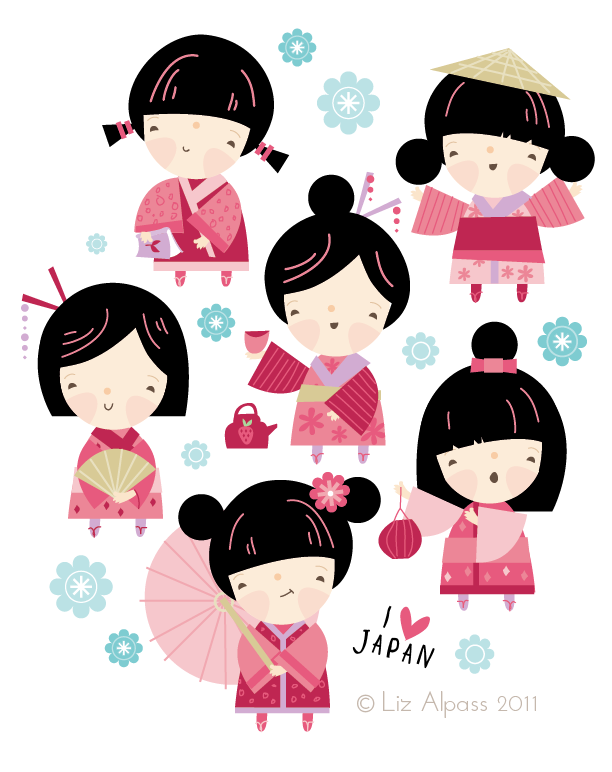 I previously posted a Kokeshi design I did for work. It was so much fun I decided to create another but directed more for kids. I think it turned out rather cute but not sure if I have finished it. I will have to sit and think about it for a bit. Is anyone else like this? OMG Lizzle this is ssoooo sweet! I adore it! Yes i totally need to give my illos time to breathe before I decide whether or not they are finished... sometimes I come back to them the next morning and think "what the hell was I thinking?!" haha! But this looks perfect to me - love it!